OAKLAND, Calif. — Here we go again. A California religious radio impresario who predicted — wrongly — that the end of the world would begin on May 21 revised his prophesy on Monday, saying now that the end is due in October. In a rambling, 90-minute speech, broadcast both online and on his stations, Harold Camping, whose Family Radio network paid millions of dollars to promote his prediction, said that he was stunned when the rapture did not happen on Saturday. So what’s the excuse for the May 21st Rapture Fail? What he decided, apparently, was that May 21 had been “an invisible judgment day,” of the spiritual variety, rather than his original vision of earthquakes and other disasters leading to five months of hell on earth, culminating in a spectacular doomsday on Oct. 21 — something he had repeatedly guaranteed. On Monday, however, Mr. Camping seemed satisfied with his new interpretation, which apparently spared humankind its months of torture for a single day of destruction. 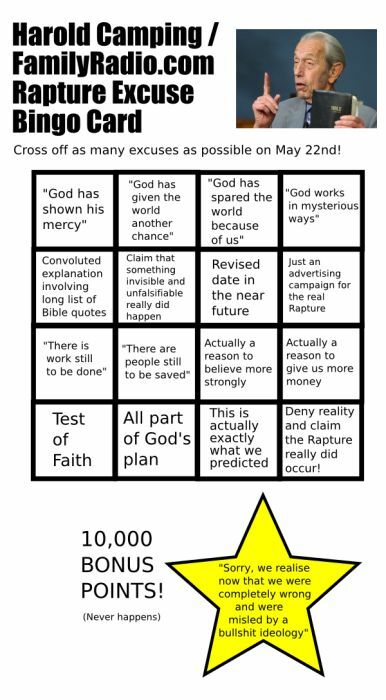 Everybody check your rapture bingo card. We have a winner!